BUCYRUS — Alexandria Rule, a member of the Class of 2018 at Bucyrus High School, will enroll in a three-year program at the University of Toledo thanks to the credits she earned through the College Credit Plus program at Bucyrus. Rule earned 21 college credits and will save her family more than $10,000 in college tuition costs when she enrolls as a Rocket in the fall. Alexandria has been a member of the Varsity Basketball and Volleyball teams, Student Council, National Honors Society, Science Club, Girls’ Boosters and Crawford County Leadership Council. She serves as Vice President of the Senior class, Treasurer of Student Council, President of National Honor Society, Science Club officer and Vice President of Girls’ Booster. The College Credit Plus Program, according to Rule, has helped advance her preparations for the next step in her educational journey. It has also allowed her to learn how college class work needs to be formatted and turned in. Alexandria cites that the loving, caring and nurturing environment created by the Bucyrus teachers and staff helped shape the person she is today. Courtesy photo Alexandria Rule, a member of the Class of 2018 at Bucyrus High School, will enroll at the University of Toledo with 21 college credit hours that save her family more than $10,000 in college tuition costs. 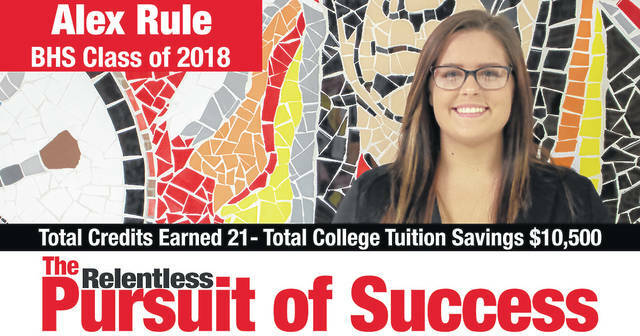 https://www.galioninquirer.com/wp-content/uploads/sites/38/2018/04/web1_alex-rule-class-2018.jpgCourtesy photo Alexandria Rule, a member of the Class of 2018 at Bucyrus High School, will enroll at the University of Toledo with 21 college credit hours that save her family more than $10,000 in college tuition costs.